Marie Laveau is commonly referred to as the Queen of Voodoo or Voodoo Queen. During her life, superstitious Creoles saw Marie Laveau as a dealer in the black arts and generally thought of her as someone to avoid. Others sought her out, however, looking for magic potions to attract lovers and things the like. Such were the perceived powers of the Queen of Voodoo. Marie Laveau's first husband disappeared and was ruled to have died under unexplained circumstances. She then took a plaçage husband, with whom she supposedly had multiple children. Marie Laveau reportedly could not read or write. And, being that she was very secretive about her life, there is much conjecture as to her true identity and history. Marie Laveau was buried in the middle vault of her family tomb at the St. Louis Cemetery No. 1. 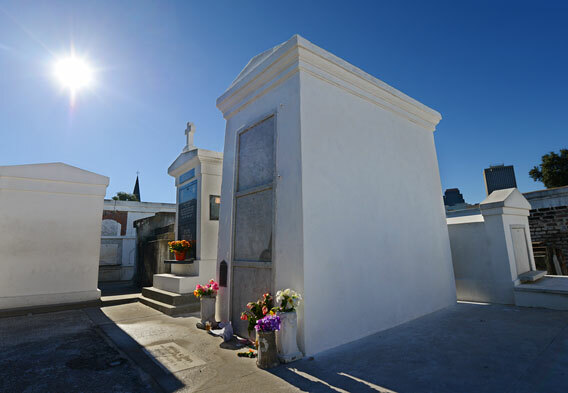 This tomb is a popular New Orleans attraction and pilgrimage site. Folklore is very much a part of the New Orleans fabric. And so it goes that there are many legendary tales to tell in this Gulf Coast city. One such tale relates to an interesting character named Marie Laveau, or Marie Catherine Laveau, as was her full name. Born either in Santo Domingo (now the capital of the Dominican Republic) in the late 1700s or in the French Quarter of New Orleans around the year 1801, nobody really knows for sure, Marie Laveau was the natural daughter of two persons of color. Both parents were biracial, to be more exact, and at least one was of Creole descent. Marie Laveau married a Haitian immigrant named Jacques Paris in 1819, as is evidenced by a marriage certificate that is preserved at the St. Louis Cathedral in New Orleans. He died several years later under unexplained circumstances. After the death of her husband, Marie Laveau formed a relationship with a white man of noble French descent - Christophe Dominick Duminy de Glapion. Together with de Glapion, Laveau had numerous children, only two of whom supposedly survived into adulthood. Throughout all of this, Marie Laveau established herself as a New Orleans legend, emerging as the city's Voodoo Queen. According to some accounts, one of her surviving children, who was also named Marie, assumed the role as the Voodoo Queen of New Orleans after Marie Laveau died in 1881. Due in part to a large Haitian immigration in the early 1800s, New Orleans became a sort of melting pot in the 18th and 19th centuries. Slaves and Creoles mixed with free people of color and so on, and many of these people practiced a brand of voodoo that incorporated various other religious influences. Such religious influences were African, Catholic and Native American in origin. New Orleans Voodoo, also referred to as Louisiana Voodoo, could also be described as a set of spiritual folkways that reflect the African Diaspora. Its liturgical language is that of the Louisiana Creole people - Louisiana Creole French. Marie Laveau rose to become the most famous, and supposedly the most powerful, practitioner of New Orleans Voodoo. Worth noting is that Marie Laveau was also Catholic. Her Catholic strategy was largely influential in the adoption of Catholic practices into the voodoo belief system. The Marie Laveau tomb is a popular New Orleans attraction. You might even call it a pilgrimage site, as many people who visit the tomb come to call on the Voodoo Queen's spiritual powers. These powers are believed by some to be undying. 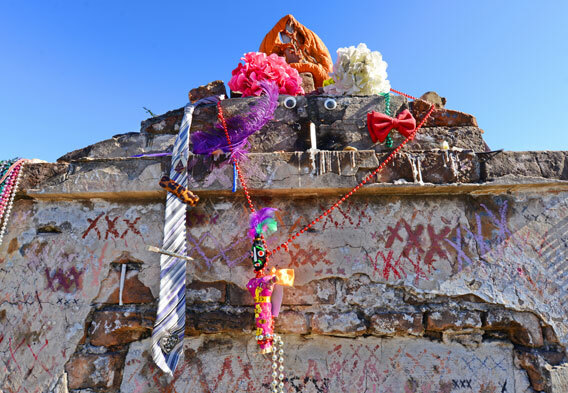 Other visitors to Marie Laveau's tomb in New Orleans have simple reverence in mind, and there are those who are just looking to satisfy a curious interest. 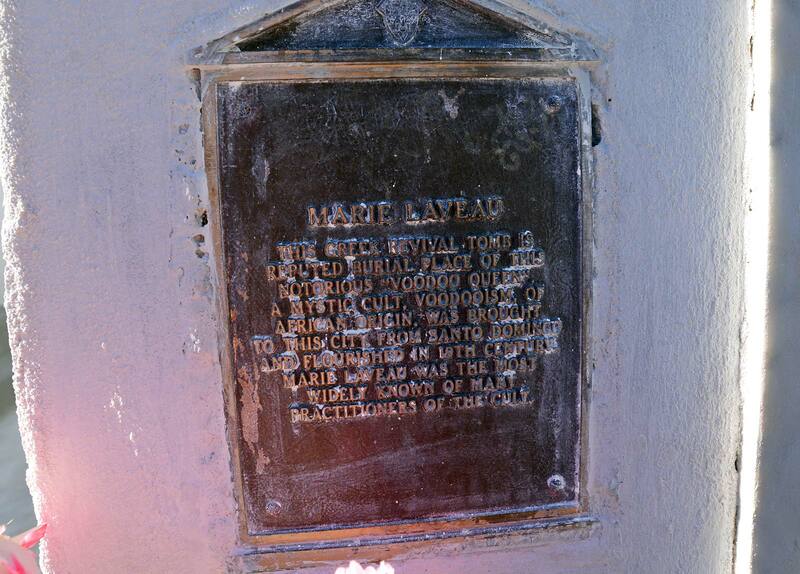 You can find the Marie Laveau tomb at the St. Louis Cemetery No. 1. This is the oldest and most famous of the three different cemeteries that collectively make up the St. Louis Cemetery system. That makes it the oldest cemetery still standing in the city of New Orleans. It opened in 1789 and has been in continuous use ever since. The address for the St. Louis Cemetery No. 1 is 425 Basin Street (GPS coordiates: 29.9591681,-90.0714380). That puts it just one block beyond the inland border of the famous French Quarter district and eight blocks from the Mississippi River. Many visitors to the Marie Laveau tomb scribble Xs on the whitewashed exterior. This practice is discouraged by preservationists. New Orleans is home to historic cemeteries that serve as the final resting places for many notable people. As you might suspect, many of these people are significant in the history of Louisiana. The New Orleans cemeteries also get a lot of attention for their lovely monuments and distinctive above-ground burials. Some family tombs are like miniature houses, even boasting iron fences in some cases. You tend to find above-ground burials in low lying places where the water table is high. In addition to the St. Louis Cemetery No. 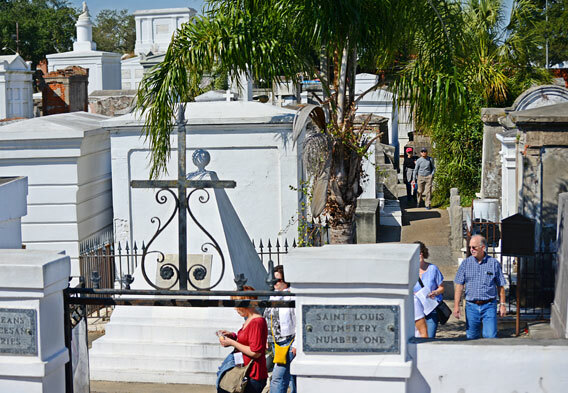 1, other New Orleans cemeteries that attract curious sightseers include the St. Louis Cemetery No. 2, the St. Louis Cemetery No. 3, and the Metairie Cemetery. Complementing these are some 38 other cemeteries that are found in the New Orleans area. It is recommended that you visit the New Orleans cemeteries with a group or on an arranged tour. Several companies offer cemetery tours. New Orleans is one of the great cities in the United States. And, you don't have to visit during Mardi Gras to enjoy your time in town. 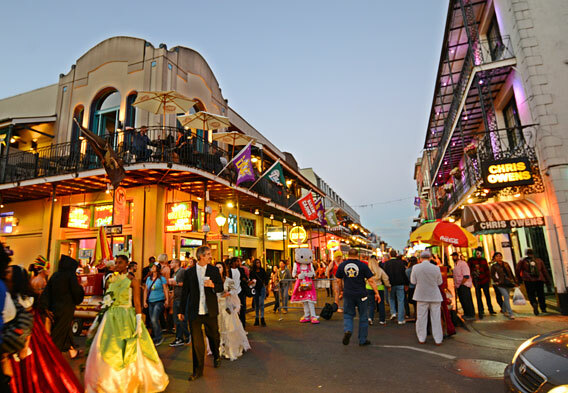 The streets of the French Quarter are a joy to wander regardless of the season, and while sightseeing takes center stage during the day, it's the New Orleans nightlife that stirs things up after the sun goes down. History, culture, jazz, voodoo, Creole cuisine. There are many reasons to visit New Orleans, and if you've never been there before, nothing can quite prepare you for the city's somewhat strange and magical allure.